Our feature project is a reclaimed wood bed by ‘Reclaimed Rustics‘… they build amazing reclaimed furniture from old barn wood. Go check out their work! Ok, this barn wood DIY headboard by ‘508 RD‘ is crazy amazing, and not just because it looks so cool… Do you just LOVE the chalk note? Part of the reason it’s so cool is that it only cost them $8 to make. Yup. 8. Go check out their portfolio! Diana at ‘Our Vintage Home Love‘ has another take on the barn wood headboard, with a full tutorial and lot’s of photos! Gorgeous room, and she really makes this project look easy… don’t let power tools scare you, they are no tougher than using the can opener! Brook at ‘Being Brook‘ has this tutorial for her rustic wood headboard, and what I love about this one is that she gives you a step by step for this really cool, and incredibly easy aged wood finish… She used an Ana White plan for the headboard itself… we love Ana! Free woodworking plans for anything! So you want to build a pallet headboard, but have absolutely no idea what you’re doing? Np, just go see Lauren at ‘The Thinking Closet’. This is one of the most thorough and complete tutorials I’ve seen on working with pallet wood, and the headboard turned out amazing! 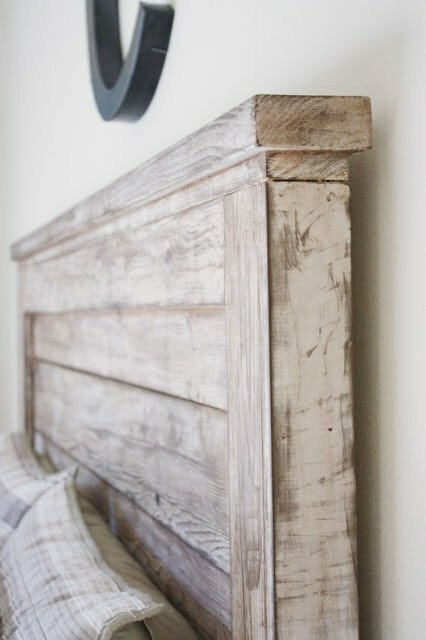 On ‘Hometalk’ we found this rustic headboard from reclaimed wood by ‘Beach Bum Livin‘ , and there is a whole tutorial on how to do this project with whatever wood you can find laying around. Suzi from ‘The Accent Piece‘ made this incredible wood bed from reclaimed wood… it used to be their friends old deck! She shows you step by step how they did it, and even proves how sturdy it is… you have to go check out her site and the tutorial of this DIY rustic headboard and bed frame. We thought we would inspire you with more headboards from old doors… and we are starting with this drop dead gorgeous bedroom and headboard by Maria from ‘Dreamy Whites‘. Ok, go to her site. Even if you have no intention of building a headboard, go. Now. Soak up the amazing romantic feel, the inspiring photos, and then when you are done drooling over her every room, come back here, and get some more DIY headboard inspiration! 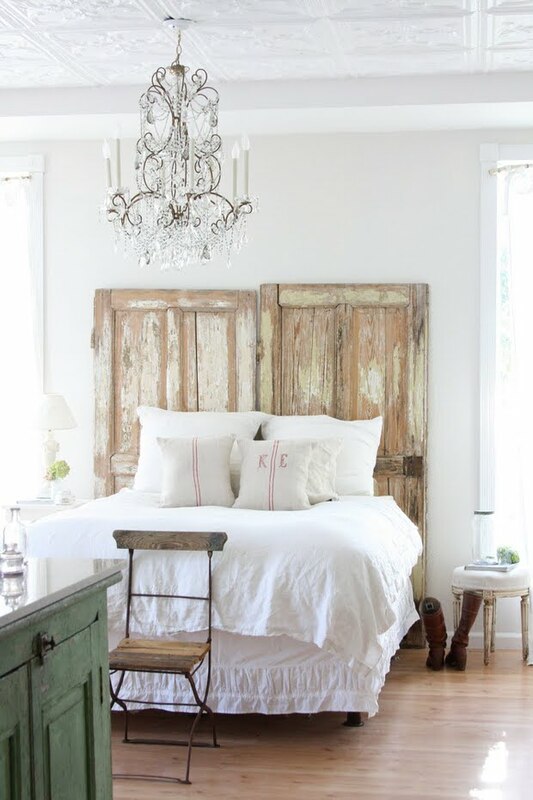 From ‘Tangly Cottage‘ in Cannon Beach Oregon, comes this rustic headboard from an old door…. even fits in this awkward space! Lastly we have this cute girls bedroom with a shutter style rustic headboard from ‘Tara Lowry‘… Love the color! So, are you heading out to the woodpile this weekend? 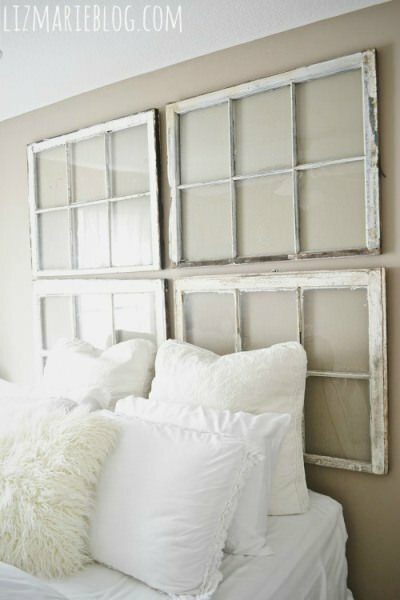 Did you just love these DIY rustic headboards? 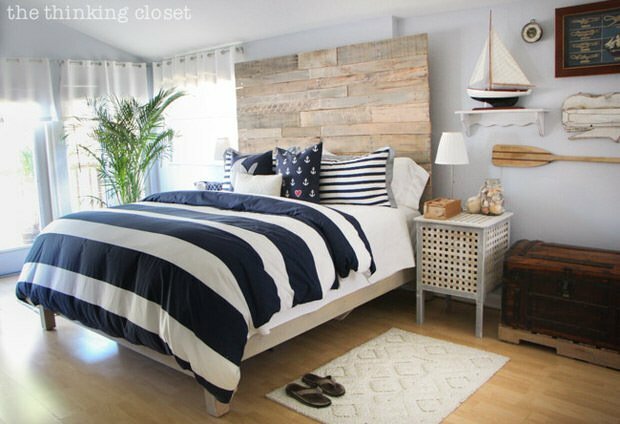 Then go check out our other post on 16 DIY Headboard Ideas and DIY Murphy Beds!